"Small bite-size twice-baked potatoes with a Cinco de Mayo flair!" Place potatoes onto a baking sheet and bake in the preheated oven until tender but still firm, about 25 minutes. Remove potatoes and set aside. When potatoes are cool enough to handle, cut them in half. With a melon baller, scoop centers out of each potato, leaving a thick shell. Place scooped-out potato centers into a bowl. Arrange hollowed-out potato halves onto a baking sheet. Mash scooped-out potato centers in a bowl with green salsa and butter; season with salt and black pepper. Spoon the mixture lightly into the hollowed-out potatoes; do not overfill. 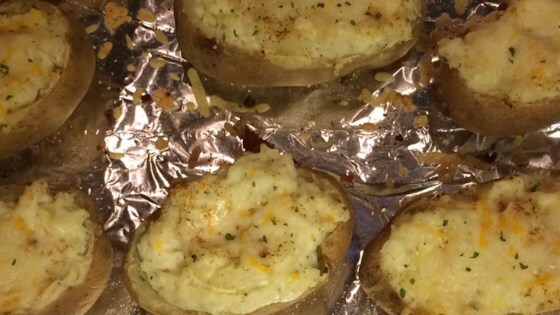 Top each filled potato half with a pinch of white Cheddar cheese. Place potatoes under the broiler about 6 inches from the heat source until tops are browned, about 5 minutes. This is so simple yet tasty. I made these instead of the same old holiday dishes. Well they were a hugh hit everyone asked for the recipe.